The Costa Mesa Parks and Recreation Commission meets again on Thursday, June 23, 2016 in City Council Chambers at City Hall beginning at 6:00. You can read the brief agenda HERE. This meeting is noteworthy because, even though the agenda is small - a tree removal request and the plant palette for Fire Station #1 - a new member will be seated on the dais to replace Don Harper, who resigned after not making several meetings in a row. Julie Mercurio, the Queen of the Costa Mesa Public Square - that inaccurately-named Facebook page - will be sworn-in by City Clerk Brenda Green and seated on the dais to join Chairman Brett Eckles, Vice Chair Bob Graham and commissioners Kim Pederson and Byron de Arakal. I'm sure those gentlemen - and they all ARE gentlemen - will welcome Ms. Mercurio with open arms. I expect there will be a large turnout for this event since her Facebook page boasts more than 6,600 members. We'll see. As I've said before, Ms. Mercurio was the least-qualified of the dozen candidates who threw their hats in the ring for this job, but it came of no surprise to me that the council majority chose her. She's running for City Council and needs all the positive exposure she can get since she otherwise brings ZERO qualifications to that job - or this one, for that matter. I'm looking forward to seeing what she does to earn the pay for participating on this commission. She is wearing that apron....I wonder what she was serving up when that picture was taken? Geoff, great commentary in the DP. You expressed my feelings perfectly. A shill for the pro-development council majority. Anyone who has been on CMPS for any amount of time knows the type of posts she would make and is clearly unfit to serve on a council. I am embarrassed for this city if that is all there is to offer. I know this city can do better. I know the residents deserve better. I want to see Humphrey back, and Genis back, and John Stephens in there this time around. Its time for some honesty. 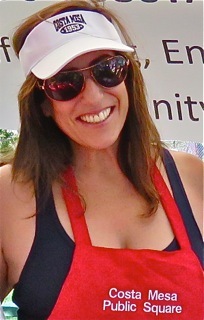 The apron was because she was serving chili at a chili cookoff at Halecrest. I imagine in the future, her job will be to serve up whatever Jim wants - vote wise. Ms. Mercurio had better hope that every one of her Costa Mesa Public Square members are registered voters in the City of Costa Mesa or she is done with her City Council bid. We all know that the Facebook world has people and friends from all over the world,and not just the Costa Mesa area. 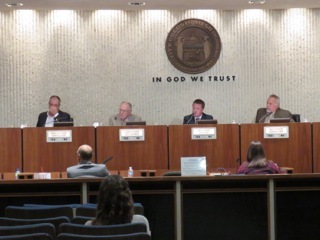 Some of those Costa Mesa Public Square members are pseudonyms. One member makes his own "arm strong" by patting himself on his own back. Can schizophrenics vote more than once? They're in full force on the Pilot. One a-hole even thought I was you, Geoff! I take that as quite a compliment.